by engagement photographers Luke & Ashley. First… What is an engagement session? Most people know what an engagement session is. It is the portrait session taken place before the wedding that captures the newly engaged couple during this new and exciting time in their lives. An Engagement Photography Session is usually scheduled shortly after finding the wedding photographer and most wedding photographers include one in their packages. Planning your engagement session is part of the wedding planning process and usually is something for the bride and groom to check off their wedding planning checklist. Engagement photography is extremely popular right now and has been for a while. However, why is an engagement photo session so important? As engagement photographers, we ALWAYS encourage our couples to take advantage of the engagement sessions. Not only do our couples receive beautiful and unique engagement photos, but they also receive a time to get to know their wedding photographers. On the wedding day, your photographer will spend the whole day with you, mostly by your side or at least close proximity. After years of experience as wedding and engagement photographers, we have come to realize how important it is to build a relationship with our couples. Our couples are more than a transaction to us. When we arrive on the wedding day, our first priority is making sure that the bride and groom are comfortable and as stress-free as possible. Luke and I want to ensure them that they can trust us to look out for them as well as capture their story as it unfolds. Wedding days can be stressful. Being in front of a camera all day can be stressful. Can you imagine a stranger showing up to the wedding with a camera? That sounds stressful! This is why we encourage the engagement session. It is a time for our couples to get to know us and for us to get to know them. We don’t have to walk away being best friends, but I do want to walk away with them being comfortable and confident in our presence. Now that we understand what an Engagement Photography Session is and why it is important for not only the couple but also the photographer, I want to share some quick tips! Deciding on which outfit to wear every day is already a lot of work for me! Deciding on which outfit to wear in front of a camera has made me stress for weeks! However, when choosing what to wear for your photo session doesn’t have to be complicated. When selecting, choose clothes that you feel confident in. Clothes that accentuate your best qualities and hide that which you might not be too comfortable about. We say bring 2-3 outfit choices. One that is dressier and classy. Something you might not wear on a normal occasion. This gives you an excuse to dress up and feel fabulous. The other outfits can be more casual, something fun and best represents you as a couple. * On a side note be sure to dress for the weather. The main thing is to be comfortable. You don’t want to be in a little dress freezing in February! I love Abbey & Dillon’s outfit choices. She wore a beautiful deep blue jumper with a sweater. The sweater kept her warm in the fall air and was a great layering accessory. Paired with Dillon’s maroon shirt, they looked amazing! Remember to compliment colors. Don’t try to match perfectly. Keep reading to get ideas while you are planning for your engagement photography session ! 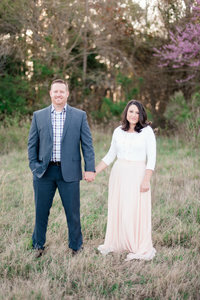 Jared & Shayna went for a more casual look for their couple’s session and it worked! I love how comfortable and confident they look in these engagement pictures. They totally rocked this session! Living in this area we are pretty lucky. The Hampton Roads area has so many beautiful locations to shoot at. From the beach, gorgeous parks, and historical areas, we lucked out when it comes to engagement photography locations. Sometimes our couples will pick locations that are meaningful to them. Below Mark & Caroline chose William & Mary. This is where they went to school, where they met, and where he asked her to be his wife. The campus was the best choice for them because it had so much meaning and I love that Mark took us to the bench where he proposed. What if you’re just not sure on location? That is okay. That is why you have hired us! We have done the research, sought out the best spots and have made a list compiling our favorites! As I mentioned before we live in a great area that doesn’t lack in locations! From the Botanical Gardens to DC and everything in between I am sure you will find a site that is the perfect spot for your engagement session! We get asked a lot by our brides if they should book hair & makeup for the engagement session. I will say yes every time. The reason being is that when you get your hair and makeup done by a professional who you trust then you will feel at your best. Being confident in this will help you relax in front of our cameras. We are lucky to have gorgeous brides who really don’t need any help at all! However, we have taken notice that when a bride opts for hair and makeup for their portraits then there is a different dynamic and the confidence overflows. We have worked with some amazing artists and have a list on who we can refer you to. Just ask us! We had to include this as a tip for your engagement photography because sometimes we just forget. This session isn’t meant to be something that you check off your list. Your engagement photo session is meant to document this incredible love story that you are beginning. This session is to break the ice and get comfortable with your photographer. The bonus is gorgeous pictures! Enjoy the ride and have as much fun as you can together through this wedding planning process. By choosing the right photographer and following the tips above, you can ensure to walk away with unique engagement photos that capture your love story and the beginning of this journey. You might be wondering what do you next with all these amazing pictures from your engagement shoot! We recommend first making some prints. Get them off the computer and into your home to show them off! Depending on how far out you planned your portraits, you can order some save the dates. Engagement pictures also make great gifts for parents and grandparents for birthdays and Christmas! These pictures are also great to use on your personal wedding website for all your guests to see. We hope this guide has helped you in the planning for your engagement photography session process. This is an exciting time and we hope we can ease some of the stress that goes into all this planning! We hope this extensive guide puts you at ease as you plan for your wedding and engagement photography session. If you are newly engaged and would love to learn more about us, head on over to our contact page and tell us all about your wedding day plans! To see more awesome engagement sessions click below!